The Kuskokwim Ice Classic Tripod took its stand on the river ice outside Bethel on February 26, 2019. Vehicle traffic is still using the river as a transportation route. The tripod signals that break up is soon expected. 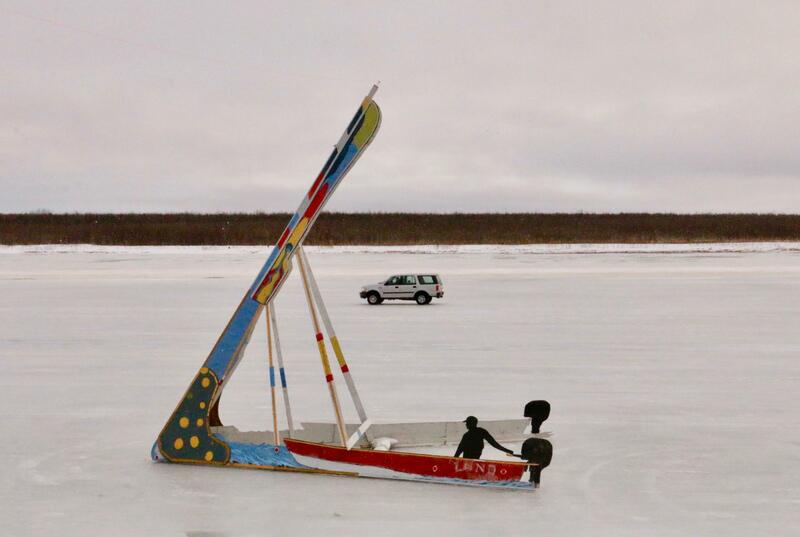 The Kuskokwim Ice Classic tripod went up on February 26, 2019, nearly a month earlier than last year, when it was erected on March 21, 2018. The Bethel Community Services Foundation uses the tripod as a fundraiser. Executive Director Michelle DeWitt says that no one she has talked to can remember the tripod going up before March, but the foundation does not have the records to verify that information. The tripod goes up a few weeks before breakup is expected and usually means that boating and summer are around the corner. When the ice washes away, it carries the tripod with it, tripping a clock located on shore and marking the official time of Bethel's breakup. People buy tickets guessing when the clock will stop, and the money funds youth programs across the Yukon-Kuskokwim Delta.